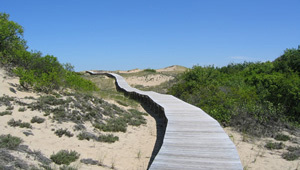 Established in 1942, Parker River National Wildlife Refuge consists of 4,662 acres on the southern two-thirds of Plum Island, a barrier island on Massachusetts' Northeast coast. It provides a crucial flyover stop and nesting habitat for over 300 species of resident and migratory bird species including the federally threatened piping plover. In 1985, The Trust for Public Land added an additional 12 critical acres to the refuge. Besides providing habitat for birds and wildlife, this pristine coastal habitat is also enjoyed by visitors who come to swim, hike, surf, fish, and birdwatch.